Fistfights broke out near Martin Luther King Jr. Civic Center Park, where Trump supporters had scheduled a rally. Fireworks and smoke bombs were thrown into the crowd, and a few demonstrators were doused with pepper spray. Both groups threw rocks and sticks at each other and used a large trash bin as a battering ram as the crowd moved around the perimeter of the park. One bank boarded up its ATMs before the rally as a precaution. About 250 police officers were deployed to the scene by mid-afternoon after officials sought assistance from the neighboring Oakland Police Department. 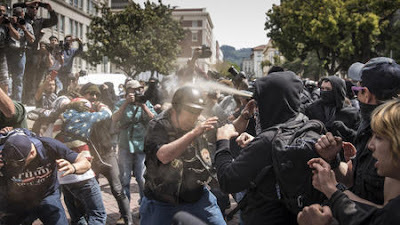 Twenty-one people were arrested, including some on suspicion of assault with a deadly weapon, according to Officer Byron White of the Berkeley Police Department. Eleven people were injured with at least six taken to a hospital for treatment, including one stabbing victim. Police confiscated knives, stun guns and poles, White said.